Summer is finally here in the capital and visitors and locals alike are in search of things to do and a little respite from the sticky stagnant air of the the main thoroughfares. Of course London boasts some great expanses of green spaces the majestic Hyde Park, sedate St James Park and adventurous Regent's Park. But what about romantic floral hideaways? Those secret gardens of the capital where you can kick back and unwind in your own tranquil Arcadia. Here are my favourite hidden gardens in London. Image by Steve Bowbrick via CC BY 2.0 licence. Do you think Kings Cross is an urban jungle? Wrong. Just a short stroll from St Pancras station and the Eurostar terminal is a couple of acres of wilderness along the banks of the Regent's canal. With pond, meadow and woodland you might spot a reed warbler or a kingfisher and apart from the distant sound of trains pulling into the station, you could imagine yourself in the middle of the countryside. Don't expect much planting here. This is zenlike minimalism with symmetrical beds in chequerboard pattern filled with fragrant lemon thyme. 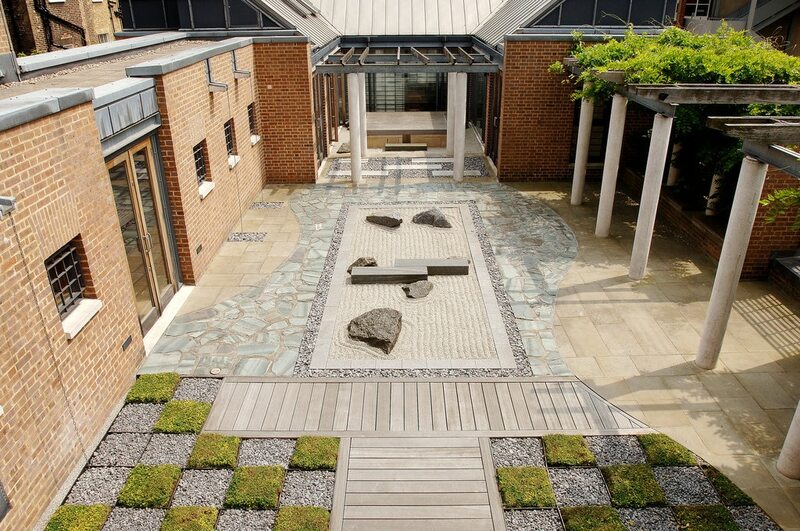 The garden was created in 2001 as a space for quiet contemplation on the roof of the Brunei gallery, which is part of the School of African and Oriental Studies near Russell Square. The garden is dedicated to forgiveness, which is the meaning of the Kanji character carved on the garden's granite water basin. Rather than plant varieties, there is instead various types of stone: a sweeping curve blends the rectangular sandstone paving with irregular green slate; the central area of raked silver grey granite chippings has regular slabs of basaltic rock that allude to a bridge over flowing water; the stone islands in the gravel areas are Larvikite from Norway; dark grey pebbles form a contrast in colour and texture to the formal granite edging. You can find some shade under the climbing wisteria and if you are lucky you might catch a recital from some of the students who use the the garden for performances. Image credit: National Trust Images/Arnhel de Serra. 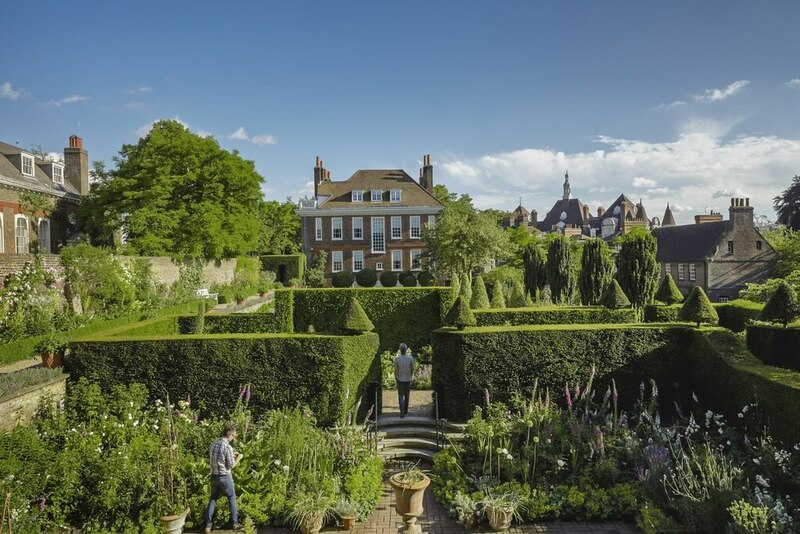 The 300-year-old walled gardens of this National Trust property in Hampstead feature luscious lawns, trimmed topiary, a quaint rose garden, an inspiring kitchen garden and a historic orchard, which produces 32 varieties of historic apples and pears. At this time of year the place is a burst of colour, with phlox, foxgloves, alliums, iris and peonies among the flowers in bloom. Perfect for taking a stroll, admiring the planting and sitting in quiet contemplation. 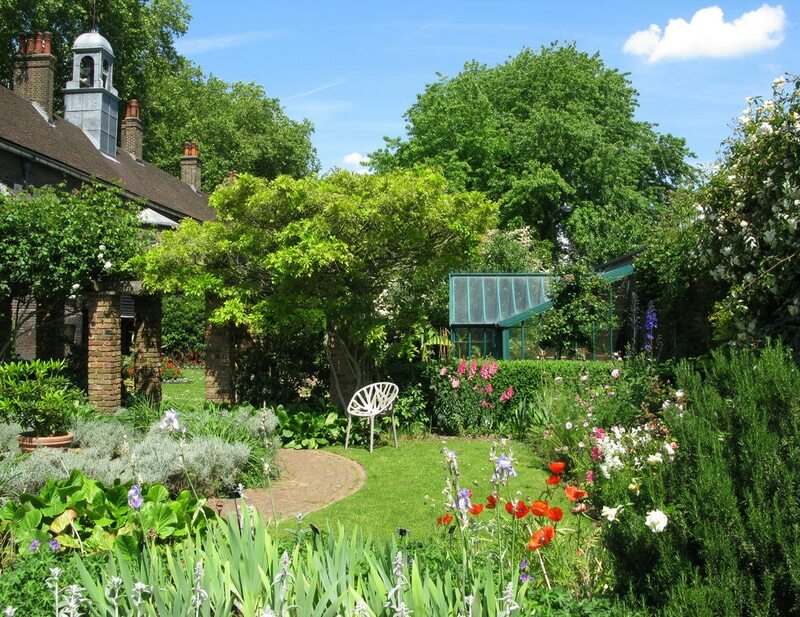 The museum itself is a wonderful romp through the way we have set up house from 1600 to the present day and as an added bonus the gardens here are peaceful and offer an alternative to battling with the beer drinkers for space in Hoxton Square. The buildings date from the early 18th century and some of the trees surrounding it are 300 years old. The herb garden is particularly fragrant at this time of year, with 12 beds containing more than 170 types of herb divided according to whether they were traditionally used for culinary, cosmetic or medicinal purposes. Take a seat under an arch covered with rose or honeysuckle or wander through the period gardens, which highlight the key styles of garden design over the past four centuries.